Wintertime, about a week before I was to begin physical transition, I was at a Quaker retreat. At this point in time, folks who didn’t know me consistently and incorrectly presumed I was a cisgender woman, much to my dismay. This is a product of our cis-normative society, cis-normative meaning that everyone is presumed to be cisgender until proven otherwise, and those of us who fall outside the norm are left with the burden of claiming our existence (which is one of the themes of my writings here). I was particularly cognizant of this burden when we were doing introductions at the beginning of the retreat. We stood in a circle, taking turns saying our names and where we were from. I had to make a choice. Even though the name I use is typically a male name (according to cis-normative standards), this never seemed to tip anyone off. This was early enough since first coming out as transgender that I still felt incredibly vulnerable pointing out my gender situation. As my turn approached, anxiety rising, I considered my options. Do I throw in that my preferred pronouns are he, him, and his, even though no one else was doing so for themselves, outing myself on the spot? Am I willing to make myself so vulnerable as to verbally point out my gender situation in front of so many new people in order to potentially reduce being misgendered a tiny bit (presuming anyone remembered later, which was no guarantee)? Ultimately, the anxiety of the moment won out over the constant background anxiety of bracing to be misgendered, and I chose not to. What I did do, however, was write my pronouns on my nametag. While it did require some vulnerability on my part to wear my gender situation around my neck in this way, it was way preferable to being misgendered. This was a simple, straightforward way to alert folks to my preferred pronouns without having to have multiple coming out conversations with people I just met. And it worked, for the most part. At the next retreat, several months later, pronouns were incorporated into introductions, and more folks wrote their pronouns on their nametags. Many cisgender folks often feel silly or uncomfortable stating their preferred pronouns in this way. Isn’t it obvious? some think. Some will try to joke about it – jokes playing on the fact that we’re just pointing out the obvious… aren’t we? The answer, though, is no, someone’s preferred pronouns are not obvious. We just presume they are. If my preferred pronouns were always obvious, I would never have been misgendered, even when people incorrectly interpreted my physical presentation as female. I have met folks who, according to my cis-normative training, I would presume to be clearly male or female and thus use the dominantly associated pronouns, but who then shared that they preferred otherwise. 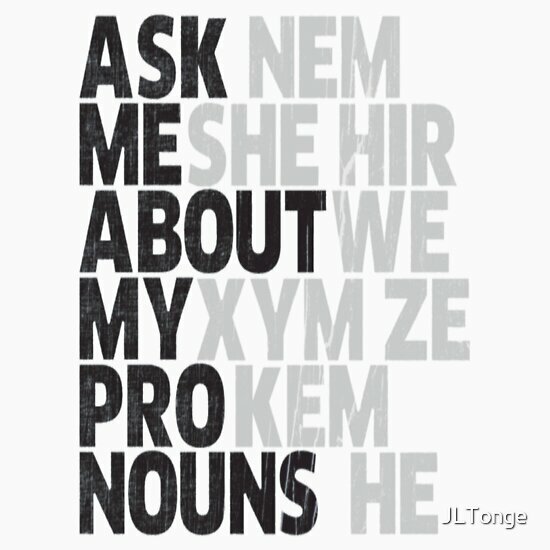 While it is statistically likely that someone you perceive to be male or female will use the dominantly associated pronouns, as we’ve all been trained to presume, this is not always the case. As I have stated before, you cannot tell someone’s gender identity or preferred pronouns simply by looking at them. When cisgender people go out of their way to state their preferred pronouns, even when their pronouns line up with culturally dominant expectations, it is an act of solidarity and resistance, and it helps lift the burden of those of us whose pronouns are obscured and not obvious in our society. For a more in depth description of what it can feel like for a transgender person to be misgendered, I refer you back to something I wrote about my own experience several months ago: The Impact of Misgendering. Additionally, I have used the term ‘dominantly associated pronouns’ a couple of times now, and I want to expand on that a little bit. According to cis-normative society, when we perceive someone to be male, we use he, him, and his to refer to that person, because we have been taught that he, him, and his are male pronouns. According to reality, however, there are folks who do not identify as male, but who do use he, him, and his as their pronouns. The same goes for she, her, and hers. Describing either set of pronouns as male or female pronouns continues to place a burden on these folks. Gender does not equal pronouns. Finally, writing pronouns on a nametag is an opportunity for education. At a much larger Quaker conference I recently attended (~1,200 folks for a week), I once again put my preferred pronouns on my nametag, even though at this point I am correctly perceived to be male at least 80-90% of the time (as far as I can tell). This prompted questions from a number of people, often wondering why I had grammatical terms listed on my nametag. While my primary goal for having my pronouns on my nametag was to alleviate my own anxiety about being misperceived and misgendered (which was a success! ), I came to realize that education was part of the deal. I didn’t necessarily have to out myself as transgender in order to explain some of what I have written here, namely that pronouns are not always obvious, and we can all take steps to alleviate the burden. You don’t have to be transgender to help educate folks! In fact, helping out with education is part of what it means to stand in solidarity and help lift the burden. Something I have been beginning to practice doing is holding in my mind the possibility that everyone I meet is transgender, even if I will never know it. Because you know what? It’s always possible. Not only does this help me to feel less alone, it is another act of resistance against the rigid, suffocating cis-normativity that we have all been taught. It allows room for identities that I have been trained to squeeze out to emerge in my interactions with new people. I invite you to try doing the same. This entry was posted in Uncategorized and tagged cis-normativity, gender, gender identity, identity, lifting the burden, misgendering, nametags, perception, pronouns, solidarity, trans*, transgender. Bookmark the permalink.